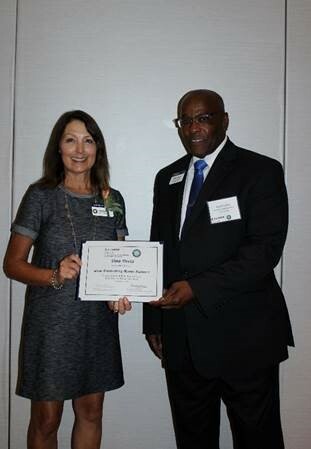 EUREKA, Ill. – University of Illinois Extension would like to congratulate Woodford County Master Gardener, Tina Deetz for being recognized as a 2018 Outstanding Illinois Master Gardener. In her two years as a Master Gardener, Tina's volunteer services and contributions to the Master Gardener program have more than exceeded expectations for this award. The Outstanding Master Gardener Award was established to honor the best of Illinois Master Gardeners. Only the top 2% of Illinois State Master Gardeners receive this award annually. They must exceed in leadership, determination, positivity, initiative and be highly involved in the program. "Becoming a Master Gardener" was always near the top of Tina's bucket list. When she retired, she made that goal a reality when she took the first ever Master Gardener training in Eureka in 2016. After graduation, Tina became heavily involved in the Master Gardener program. She has been involved in the annual Master Gardener Plant Sale coordination, Heart House project, Gardener's Gathering coordination committee, activity stations at community events, Garden of Giving at the Great Oaks Community Church, and served as the group secretary. Tina's greatest volunteer efforts have been at the Germantown Hills Middle School Garden. Tina joins the group weekly throughout the growing season to help maintain the garden, as well as works with the youth in the garden during the school year. Tina is always of the first ones to volunteer in need, and she goes out of her way to offer support to others. There is no sitting and watching others do the work with Tina! Tina sees being a Master Gardener as an opportunity to meet great people who share her love of gardening, as well as a way to encourage others to find the gratification and pleasure that gardening can bring to life. Great job, Tina! And remember, if you see her working in the gardens or teaching in the community, make sure to thank her for her outstanding efforts in improving the community and helping others learn to grow. For more information about the Woodford County Master Gardener program, visit us at go.illinois.edu/LMW_MG or contact the Woodford County Extension Office at (309) 467-3789.